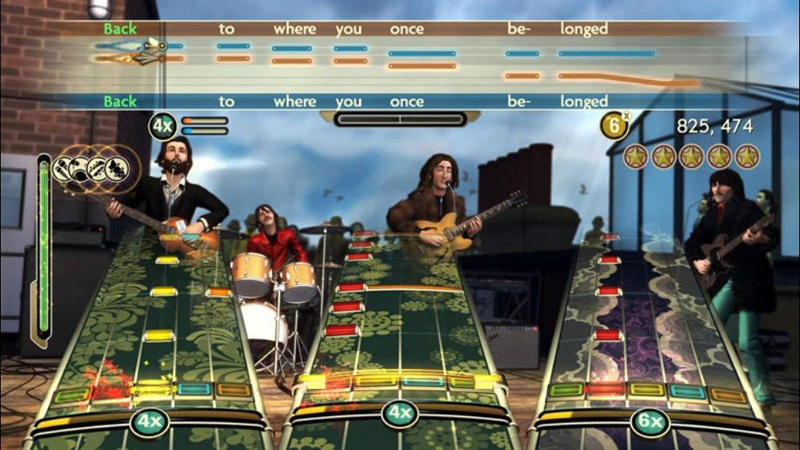 Experience The Beatles music and legacy like never before, utilizing the core Rock Band game play. "The Beatles: Rock Band" in an unprecedented, experiential progression through and celebration of the music and artistry of The Beatles. 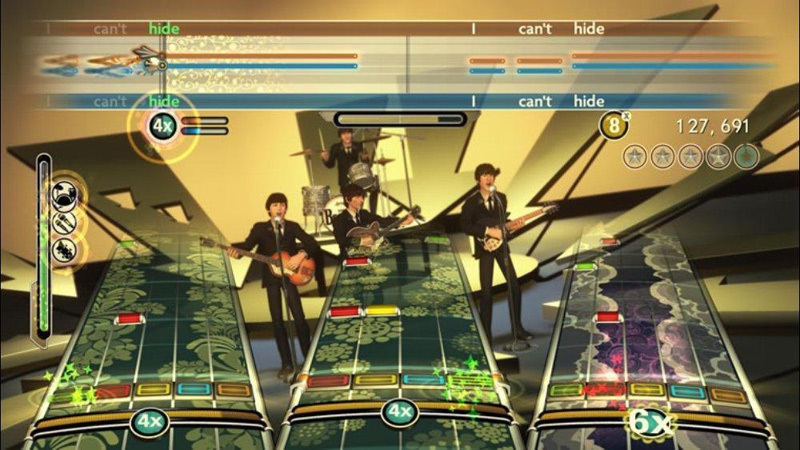 The game will allow fans to pick up the guitar, bass, mic or drums and experience The Beatles extraordinary catalogue of music through game play that takes players on a journey through the legacy and evolution of the band's legendary career. To a certain extent, this game is great because Beatles music is great. The Beatles: Rock Band is packed to the gills with excellent songs, but its real genius is the way it captures the excitement of playing in a cohesive band. Following the arc of the Beatles' career wouldn't be as engaging without the interesting bonuses and the stunning art design that so elegantly complements the music. Vocal harmonies add an invigorating new dimension to the gameplay, encouraging you to either get more people involved or challenge yourself to be all the rockstar you can be. For fans of The Beatles -- especially ones who would go as far as to call themselves “Beatlemaniacs” -- the game is absolutely essential. It features a slew of unlockable material, from photos to full videos, some of which have never been seen. Loading screens also feature never-before-heard audio from inside the Abbey Road studio, including the band chatting with one another, tuning, or rehearsing. 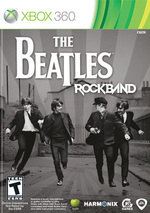 The Beatles: Rock Band is absolutely brimming with details and bonus content that are sure to please fans. Success in the story mode, for example, is rewarded with behind-the-scenes photos of the band, and accruing enough photos will unlock a series of interesting videos of the band as well. One of my absolute favorite touches in The Beatles: Rock Band is how, during the Abbey Road years, you'll hear studio noise as a song loads. For fans of the band, buying this game is a no-brainer. If your favorite song isn't among the 45 included on the disc, there's a good chance it's among the list of DLC set to drop in the near future. And if you've yet to develop an appreciation of the Fab Four, then this is a great opportunity to experience what is perhaps the most enduring catalog in the history of popular music. The Beatles: Rock Band more than delivers on the iconic band's legacy. We recommend picking harmonies – there’s no penalty for jumping off your part to the main line, and from a strategic standpoint, you triple your chances of nailing a line if there are three harmonies to choose from. If you’re a Beatlemaniac, you’re likely not in it to win it – you just want have fun warbling about, singing everyone’s part and doing your best John Lennon impression. We know. Have a good time. Personally, I'm not even that massive a Beatles fan - and yet playing this though has reminded me of everything I've ever loved about the band. If you have even a passing fondness for John, Paul, George and Ringo, this game will make you an extremely happy bunny. So while in some ways The Beatles: Rock Band marks the pinnacle of the series' and the genre's achievements, in other ways it also begins to expose its limitations. Nevertheless, viewed in terms of what it set out to achieve, The Beatles: Rock Band is nothing less than a triumph, and one with in-built longevity in the sense that these are songs that have already survived four decades unmatched, now given a new lease of life thanks to remastering and fresh enough to last another lifetime. 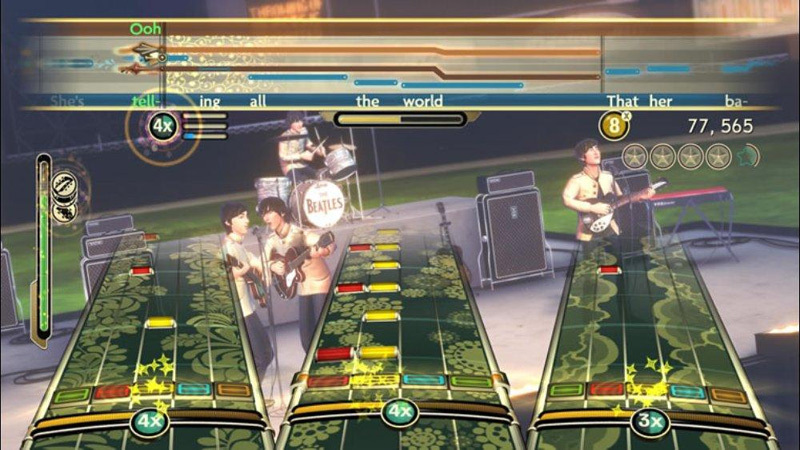 Despite initial reservations over the absence of many of the band's key offerings, it's clear that Harmonix and MTV Games has struck upon the best possible compromise to cater for The Beatles' vast and diverse fan base. 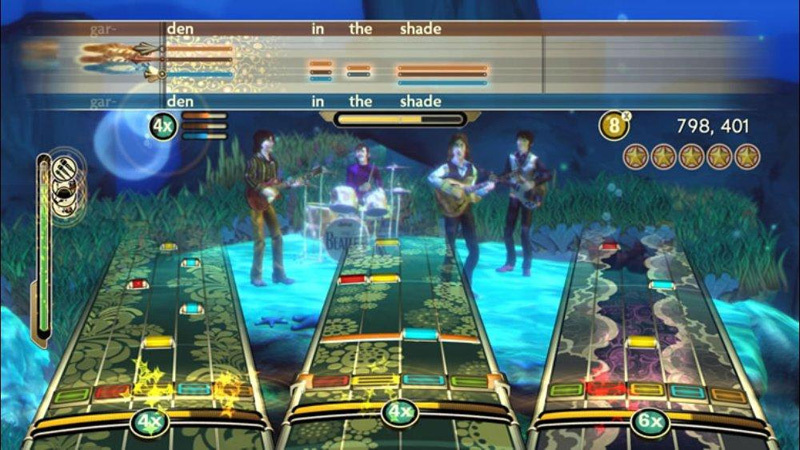 Viewed as a piece of fan service for a mass market audience, there's no doubt that The Beatles: Rock Band is a peerless offering that blows any comparable 'band-only' music title out of the water. De acuerdo en que The Beatles: Rock Band es sólo para fans, pero es tan bueno que todos los aficionados deberían echarle un vistazo. Una lista de temas algo corta, pero inmejorablemente escogida y remasterizada, y una imaginería visual sensacional. ¿Las pegas? Como de costumbre, el precio de juego e instrumentos. Al alcance de muy pocos. The Beatles: Rock Band no es barato pero desde luego que vale cada euro que cuesta. Quizás esto no se cumpla tanto en el DLC previsto, que sí resulta comparativa e indubitablemente caro. Esperemos, con todo, que la posibilidad de expandir sus contenidos no se vea limitada por la obligación de comprar álbumes completos y que exista la posibilidad de adquirir canciones sueltas: sería una lástima no incorporar inteligentemente las descargas a la vida del juego porque cuesta imaginarse un juego que pudiese beneficiarse más de ellas. 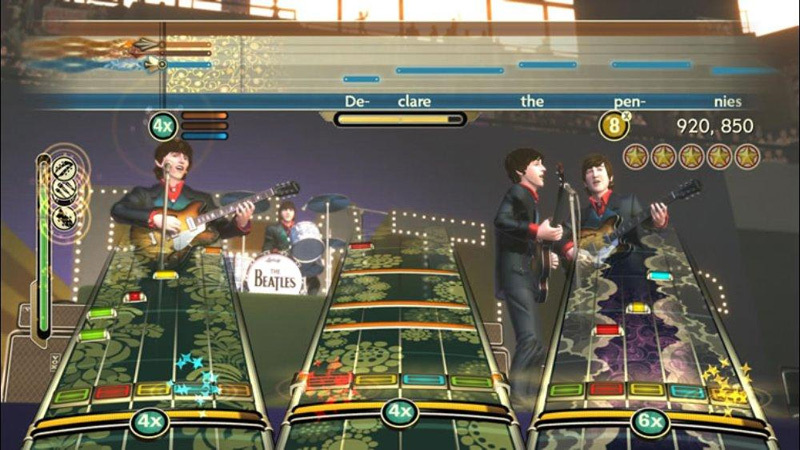 The Beatles: Rock Band es más que un acercamiento del grupo al género del juego musical por parte de sus creadores más reputados. Es una experiencia interactiva que recorre la carrera de uno de los pilares más importantes de la música contemporánea, convirtiéndose en la introducción perfecta para aquél que no conozca más que 'Yellow Submarine', así como un objeto de coleccionista valiosísimo, tanto por el cuidado de sus instrumentos como por el acabado visual, como por la propia documentación con la que nos recompensa su modo Historia. Harmonix heeft met deze game niets aan het toeval overgelaten. De opnamen zijn origineel en ook de decors zijn erg waarheidsgetrouw. Wat echter nog het meest opvalt is het feit dat de bandleden in het begin van de game jong zijn en steeds ouder worden. Er zit toch een minpuntje aan deze game en dat is het gebrek aan vernieuwing en ondersteuning. Het feit dat er drie mensen tegelijk kunnen zingen is erg leuk, maar zal niet erg vaak gebruikt worden.